The finest quality Whole Cloves. Cloves are the aromatic dried flower buds of a tree in the family Myrtaceae. Cloves are native to Indonesia and India and used as a spice in cuisine all over the world. The English name derives from Latin clavus 'nail' (also origin of French clou 'nail') as the buds vaguely resemble small irregular nails in shape. 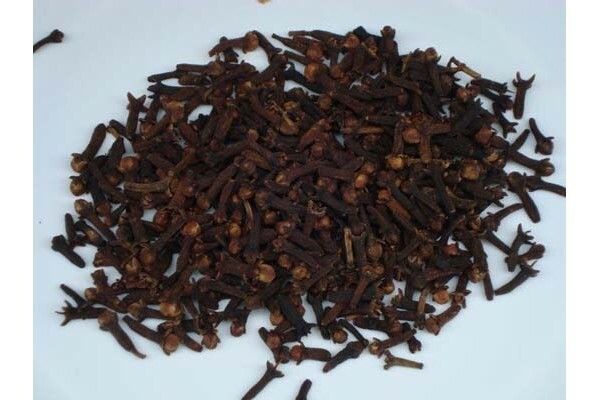 Cloves are harvested primarily in Indonesia, Madagascar, Zanzibar, Pakistan and Sri Lanka. Cloves can be used in cooking either whole or in a ground form but as they are extremely strong they are used sparingly. The spice is used throughout Europe and Asia and is smoked in a type of cigarettes locally known as kretek in Indonesia. Cloves are also an important incense material in Chinese and Japanese culture. During Christmas it is a tradition in some European countries to make a pomander from cloves and oranges to hang around the house. This spreads a nice scent throughout the house and the oranges themselves act as Christmas decorations. Cloves have historically been used in Indian cuisine (both North Indian and South Indian) as well as Mexican cuisine where it is often paired together with cumin and cinnamon. In north Indian cuisine it is used in almost all dishes along with other spices. It is also a key ingredient in tea along with green cardamom. In south Indian cuisine it is used extensively in biryani along with "cloves dish" and it is normally added whole to enhance the presentation and flavour of the rice. In Vietnamese cuisine cloves are often used to season pho broth. Due to the Indonesian influence the use of cloves is widespread in the Netherlands. Cloves are used in cheeses often in combination with cumin. Cloves are an essential ingredient for making Dutch speculaas. Furthermore cloves are used in traditional Dutch stews like hachee. Dried cloves also play a major role in the production of chai tea an Indian spiced black tea made famous in the form of a 'Latte'. The tea is described by many as having a sweet cinnamon taste.